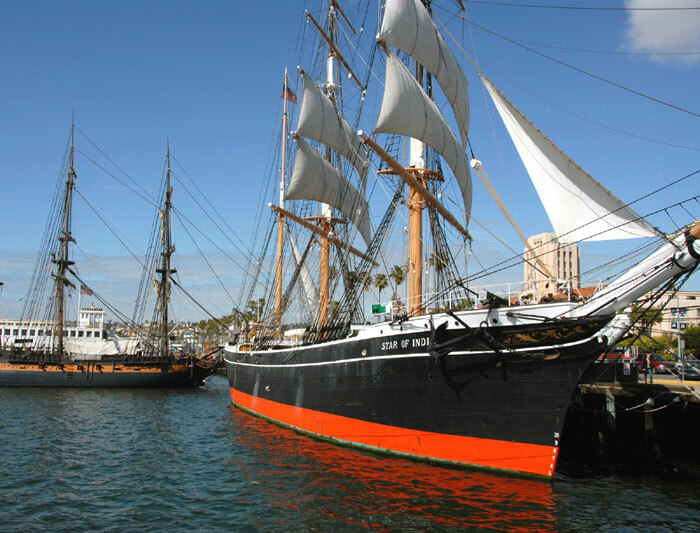 SAN DIEGO — The Maritime Museum of San Diego will celebrate the sesquicentennial of its most famous ship, Star of India, during two weeks of public events on the Embarcadero and San Diego Bay. The special events will include “companion sailings” — in which the state’s official tall ship Californian will sail alongside Star of India — as well as the recreation of scenes from the maritime days of the 1800s. Star of India was launched when Abraham Lincoln was president of the United States, and it is the oldest active sailing ship in the world. The ship is both a California Historical Landmark and a U.S. National Historic Landmark. The ship was originally built at Ramsey shipyard on the Isle of Man and was launched on November 14, 1863 as Euterpe — five days before Lincoln gave his Gettysburg Address. The vessel sailed 21 times around the world, was sold to American owners in 1898, and was renamed Star of India in 1906. A group of San Diegans purchased the historic ship and had it brought to San Diego in 1927, where it was restored and became the centerpiece of the Maritime Museum of San Diego. The public is invited to purchase tickets for three public companion sails alongside Star of India aboard Californian on three separate days: Saturday Nov. 9, Sunday Nov. 10 and Monday, Nov. 11. San Diego Interim Mayor Todd Gloria will be present a special proclamation at 9 a.m. Nov. 11 to commemorate the ship’s milestone 150th anniversary. A two-day celebration featuring a “floating marketplace” is scheduled from 10 a.m.-4 p.m. Saturday Nov. 16 and Sunday Nov. 17. Visitors can experience a recreation of an 1800s marketplace along the North Embarcadero, as well as aboard Star of India, to get an idea of what a San Diego portside market looked like 150 years ago. Vendors will display spices, silk, food and other goods of the day being sold and traded. Attendees will also see people dressed in period clothing, such as a farmer, a blacksmith, a ship captain and crewmembers. There will even be a lookalike of President Lincoln, ready to deliver his Gettysburg Address. “San Diego’s floating crown jewel is a true testament to the spirit of our community, and to the many journeys she has traveled as the world’s oldest active sailing ship,” said Dr. Ray Ashley, president/CEO of the San Diego Maritime Museum. The Maritime Museum of San Diego is located at located at 1492 N. Harbor Drive. For more information, visit sdmaritime.org or call (619) 234-9153, ext. 101.